Mylo Xyloto is the fifth studio album by British rock band Coldplay. It was released worldwide on 24 October 2011 by EMI. The band collaborated closely with acclaimed producer Brian Eno following their successful collaborations on Viva la Vida or Death and All His Friends, the band's fourth studio album. It was preceded by the lead single, "Every Teardrop Is a Waterfall", on 3 June 2011. "Paradise" was released as the second single three months later in September. "Charlie Brown" was released on 3 February 2012, and Princess of China on 14 February 2012. Internationally, Mylo Xyloto charted at number one in thirty countries. In the United Kingdom, Mylo Xyloto became their fifth album to debut at number one, selling 208,000 units in its first week, and it set a one-week digital sales record with 83,000 copies sold. The album became the group's third to debut at number one on the US Billboard 200, selling 447,000 units in the first week. It was the UK's best-selling rock album of 2011, selling 908,000 copies. To date, the album has sold over 5 million copies worldwide. 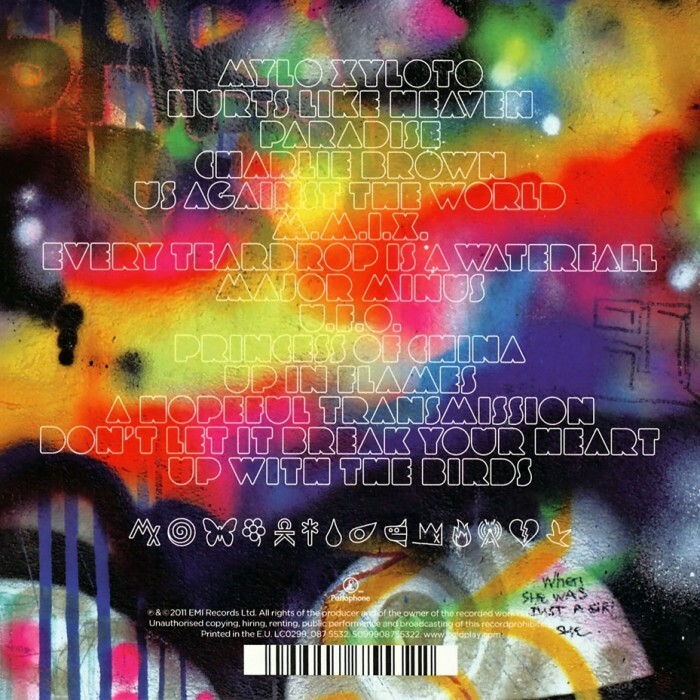 Mylo Xyloto received mixed-to-positive reviews from music critics, with a score of 65/100 on Metacritic. While some found it to be overproduced, others praised its uplifting tone. "Paradise" and "Every Teardrop Is a Waterfall" received a total of three Grammy Award nominations. Don’t Coldplay love their Xs and their Ys? And their enigmatic album titles? After 2005’s X&Y and 2008’s Viva la Vida or Death and All His Friends comes Mylo Xyloto. Well, it beats Coldplay 5. But any title that needs a pronunciation guide (it’s "My-lo zy-letoe") sounds like it’s trying a bit too hard. Maybe Chris Martin still yearns for something that infers the depth and gravitas of a Bono or Thom Yorke. The album is apparently a concept work, "based on a love story with a happy ending," Martin claims, and inspired by old-school American graffiti and the anti-Nazi pacifist White Rose Movement: "It's about being free to be yourself and to express yourself among negative surroundings." 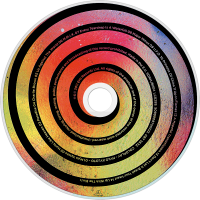 But the lyrics are still typically Martin’s life-affirming, anthem-forming and plain-speaking as ever, more ABC than MYLO XYLOTO. The same goes for the music. Bassist Guy Berryman said in 2009, "It's time to take our music down different directions and really explore other avenues," and, in name alone, this set suggests Coldplay might finally do an Achtung Baby; they might rip it up and start again, in the presence of said U2 LP’s producer Brian Eno, who also worked on Viva la Vida. 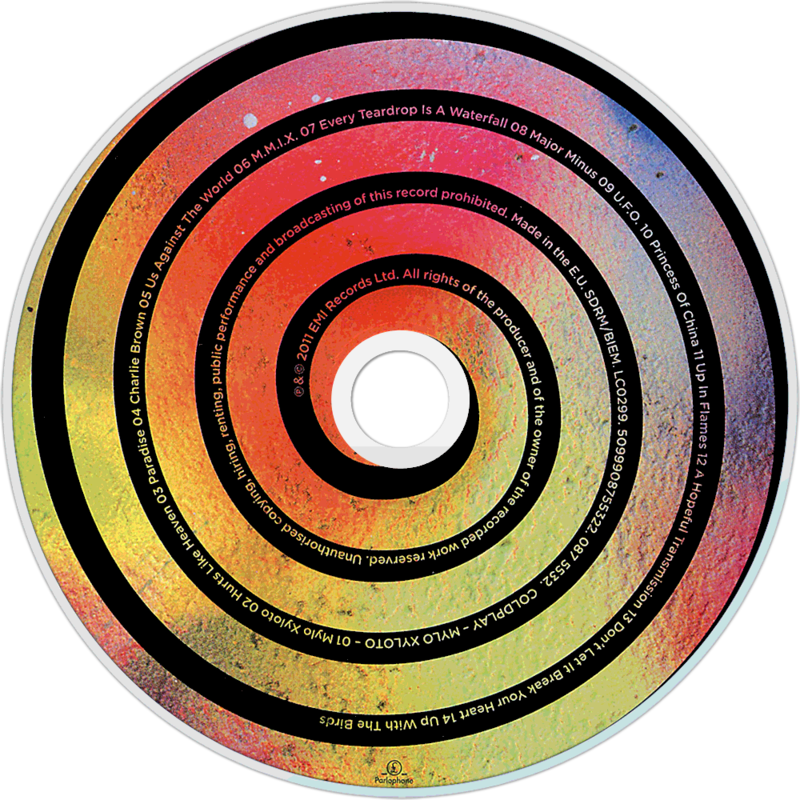 If the addition of electronic undertows, instrumental snippets (the title-track, M.M.I.X., A Hopeful Transmission) linking many of the tracks and the presence of Rihanna on Princess of China count as "other avenues", then job well done. But Mylo Xyloto is much more a brilliant, shiny and emphatic reinstatement of the euphoric hooks and cuddly ballads that have served the band so well. Case in point: Paradise, where melting strings and church organ feed into a brilliant chorus line that equal parts Fix You and Viva la Vida’s title-track. But the main vocal chorus doesn’t arrive until over two minutes in, building the tension; the pay-off is both simple and devastating. It’s the equal of Yellow, and when Coldplay return to Glastonbury it will take the roof off the sky. Every Teardrop Is a Waterfall goes one step further than Paradise by lifting Vida la Vida’s "who-hoa!" hook, suggesting Coldplay can’t truly comprehend new avenues. U2-shaped echoes still run through the deep and wide canyons of their landscaped sound ”“ Major Minus features The Edge-patented guitar chatter, but it’s nevertheless a triumph. Charlie Brown has one of those Coldplay-patented sun-breaking-through-clouds moments; Us Against the World (the sentiment that unites the graffiti and anti-Nazi camps) is the key wistful/cuddly ballad alongside Up in Flames, a successful grafting of soul onto the Coldplay model, helped by an understated falsetto and the simplest of piano parts (echoes of Parachutes’ gorgeous Everything’s Not Lost). The closing Up With the Birds, which samples Leonard Cohen, is a serene finale that shows Coldplay understand the change of dynamics more than the dynamics of change. Better this than the nominally Euro-disco bent of Princess of China, where Rihanna’s presence feels more of a marketing tool than a creative necessity, and there’s yet another "who-ay-oh-oh!" chant just in case Coldplay were straying too far from their remit. This appears to support Martin’s message of expressing the freedom to be yourself under negative surroundings ”“ not to change just because critics of the band tell them they should. Mylo Xyloto may have an oblique title but it’s a triumph because the music is anything but.